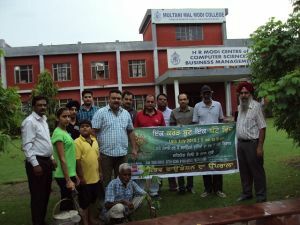 Eco-club of M. M. Modi College, Patiala in collaboration with Ludhiana based NGO Sambhav participated in a plantation drive at the college campus by planting 50 saplings on 19th July, 2015. The plantation drive was inaugurated by DFO ext. Patiala, Mr. Jugraj Rathore and his team members. College Principal Dr. Khushvinder Kumar welcomed the team members and liad stress on saving the environment by planting and nurturing trees. He also thanked the Members of ‘Sambhav’ for initiating this plantation drive from the college campus. Dr. Ashwani Sharma, Dr. Rajeev Sharma, Dr. Monita Dhiman, Dr. Diwakar Aggrawal and Prof. Amit Sareen along with the student volunteers were present on this occasion.